Villa deals for 2014 are coming online. BOOK NOW as they will get snapped up fast! If you are looking for a reduced price holiday home then keep an eye on our special offer page as we are starting to see some really good deals from our owners for this summer. Brittany in France is the main region where you can pick up a bargain at the moment with as many as nine villas in Brittany offering reductions particularly for May and June, even July. Choose from a romantic cottage on the seafront, or a charming holiday home with heated outdoor private pool or a swish villa with indoor pool and, Jacuzzi, sauna and gym facilities. Prices start at 405€. 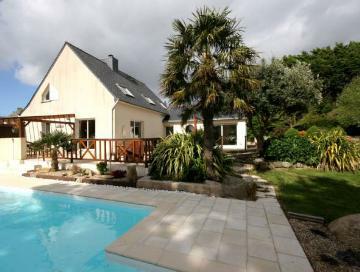 The pick of the bunch for value is the Bretagne Sud - le Guil B901 which has a private pool and is within walking distance of the beach. For a reasonably priced family holiday abroad Brittany is an excellent choice of destination as there are many good ferry services and you can even drive down from the channel tunnel. The big advantage being that there are no restrictions on baggage if you take your car. The market for villa holidays is fairly strong this year, certainly more so than the last few years. So we are finding that owners are waiting before reducing their prices and once they do the bargains get snapped up pretty quickly, Brittany is the one area where bookings are slower than usual which means there are bargains to be had. So don't be too complacent, if you see a house you like at a decent reduced rate get on and book it before someone else does. Also keep checking on our special offers page as we will be adding them more or less each day from now on until the end of the summer season. If you don't find an offer in our collection don't give up as our regular prices are very competitive anyway and remember they are in euro so you need to apply the current exchange rate for your currency if outside the euro zone. I hope you find the cut price holiday home to suit your requirements for this summer from our selection Special Offers villas. Remember book it NOW, don't delay.